As we come to the beginning of a new century, we find that the entire vista of modern poetry has dramatically changed. 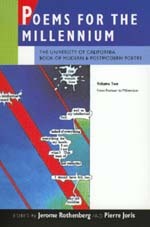 Poems for the Millennium captures the essence of that change, and unlike any anthology available today it reveals the revolutionary concepts at the very heart of contemporary poetry. International in its coverage, these volumes bring together the poets and poetry movements that radically altered the ways that art and language express the human condition. Volume 2 offers a dazzling chronicle of the second "great awakening" of experimental poetry in the twentieth century. Ranging from the period of World War II through the cold war to the onset of the twenty-first century, this volume presents two "galleries" of individual poets such as Holan, Olson, Rukeyser, Jabès, Celan, Mac Low, Pasolini, Bachmann, Finlay, Ginsberg, Adonis, Rich, U Tam'si, Baraka, Takahashi, Waldman, and Bei Dao. There are also samplings of local and international movements: the Beats, the Vienna Group, the Cobra poets and artists, the Arabic-language Tammuzi poets, the creators of a new "Concrete Poetry," the "postwar poets" of Japan, the Italian Novissimi and Avan-Guardia, the Chinese Misty Poets, and the North American Language Poets. In addition, an extended section is devoted to examples of the "art of the manifesto" and two smaller groupings of traditional "oral poets" and of experimenters with machine art and cyberpoetics. Poet-editors Jerome Rothenberg and Pierre Joris provide informative and irreverent commentaries throughout. They challenge old truths and propose alternative directions, in the tradition of the manifestos that have marked the art and poetry of the twentieth century. The result is both an essential resource for experiencing the full range of contemporary poetic possibilities and an arresting statement on the future of poetry in the millennium ahead. Jerome Rothenberg is a poet and one of the world's leading anthologists. His more than fifty books include Technicians of the Sacred: A Range of Poetries from Africa, America, Asia, Europe and Oceania (California, 1985). He is Professor of Visual Arts and Literature at the University of California, San Diego. Pierre Joris is a poet and has published over twenty books and chapbooks of poetry as well as many anthologies and translations. He is Professor of English at the State University of New York, Albany.